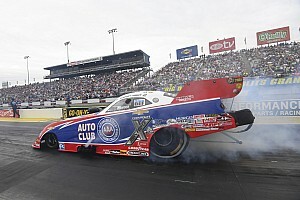 Was Clay Millican's brilliant and well-deserved first win last weekend at Bristol just the start of a hot streak? The Tennessean is showing great confidence in tuner Dave Grubnic, as Anne Proffit reports. Last weekend’s 17th annual NHRA Thunder Valley Nationals at Bristol Dragway was a great one for the underdog. It marked the first time in 264 tries that Tennessean Clay Millican held a Top Fuel Wally trophy as the race winner. In an emotional final round, Millican defeated Leah Pritchett, who’s been to the Winner’s Circle three times this year. 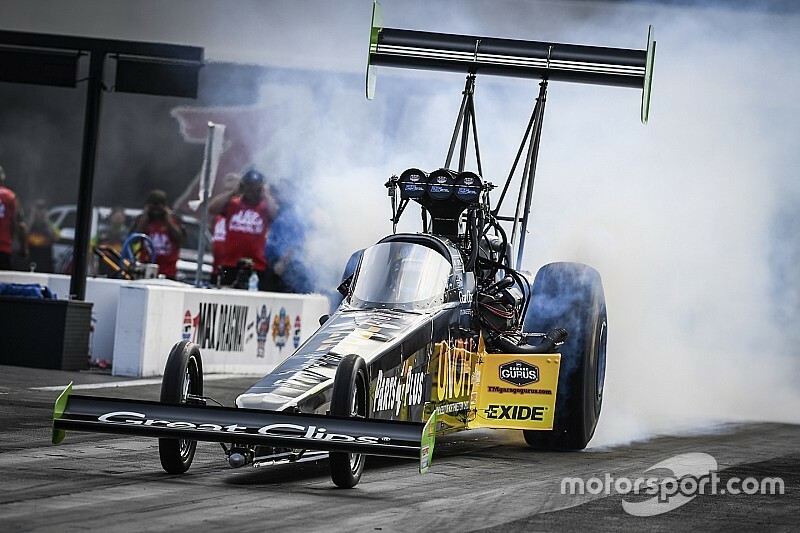 It was a straight-up contest on a hot and slick racetrack, as in the ninth final round of his NHRA career, Millican produced a 3.825/316.38 pass down the 1000-foot dragstrip to Pritchett’s 3.881/307.09. This was a monumental victory and one that apparently left everyone on the premises joyous. After gathering two straight No. 1 qualifiers so far this season, it seemed about time that Millican took his Doug Stringer-owned, Dave Grubnic-tuned dragster to the win. The always smiling Millican was unsurprisingly tearful as he dedicated the victory to his son Dalton, who died in a motorcycle accident less than two years ago, as well as his team and his fans. “I love what I do,” he said. “There were times I ever wondered if this was going to happen. I don’t deserve this credit; I’m really happy for David Grubnic and all of the boys who work on this car - and I mean that 100 percent. Millican further explained of Grubnic: “I saw a guy that was smiling and I think a lot of that stems from when we swapped chassis. He felt like he kind of got a handle on something that was giving him problems the last few races. We were going rounds, but the previous chassis would throw him a curveball. With the 24-race Mello Yello Drag Racing Series season hitting its midpoint this weekend for the 11th annual Summit Racing Equipment NHRA Nationals at Norwalk, Ohio – and ending a streak of four successive events on the East Coast – Millican is riding a wave of contentment and momentum. Still, he’ll have to contend with a healthy entry in Norwalk, always a popular race. 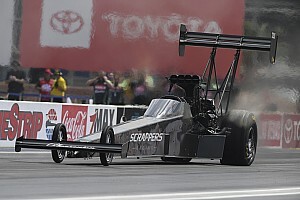 Top Fuel has a field of 18 vying for 16 spots in elimination, led by triple 2017 race winners Steve Torrence and Pritchett, triple and reigning champion Antron Brown (two wins), eight-time champ Tony Schumacher (one), consistent Doug Kalitta and single race-winner Brittany Force leading him in the standings. The balance of the top 10 are rookie Troy Coughlin Jr., Scott Palmer and Terry McMillen. On the Funny Car side of the fence, Don Schumacher Racing’s Ron Capps earned his fifth victory of the year last weekend and took a commanding lead in the standings over teammates Matt Hagan (three wins), Jack Beckman (one), John Force Racing’s winless Robert Hight and Courtney Force, and single-race winners Tommy Johnson Jr and John Force. Tim Wilkerson, JR Todd and Cruz Pedregon round out that top 10. One driver will go home after Saturday’s fourth Pro Stock qualifying session in Norwalk, but it’s highly unlikely to be last weekend’s winner Alex Laughlin, in a Chevrolet Camaro, easily the steed of success in the 2017 season. Every race thus far has been won by a Chevrolet. Although Laughlin is not running the full season and isn’t yet in the top 10, he’s a ferocious competitor who could shake up the standings in the factory hotrod class. Laughlin was the eighth driver to win a Pro Stock Wally this season. Points leader Bo Butner, who finally earned his first Pro Stock victory this year and followed that up with a second win, is one of three drivers to have notched double victories: Greg Anderson and rookie Tanner Gray each recorded two wins in the 11 events held to date. Still, they’ll have to contend with fourth-placed and winless five-time Pro Stock champ Jeg Coughlin Jr, Jason Line (one win), Erica Enders (one), Vincent Nobile, Drew Skillman, Shane Gray (one) and Chris McGaha, who has also earned a win in the initial 11 races of the season. All race Camaros. In earning the win at Bristol, Laughlin notched the second victory of his Pro Stock career and did it with a perfect reaction time in the final round, over Butner. Norwalk marks the fifth race of the year for Pro Stock Motorcycle (PSM) and, despite winning two of the four races held so far, 2010 champ LE Tonglet rides his White Alligator Racing (WAR) Suzuki into town in second place to Eddie Krawiec, who has been extraordinarily consistent on a Harley-Davidson Screamin’ Eagle V-Rod. With that bike now mothballed, Krawiec will have a tough time keeping his lead over Tonglet, reigning first-time titleholder Jerry Savoie (one win) on a WAR Suzuki, teammate Matt Hines, Scotty Pollacheck, Hector Arana, Jr., Joey Gladstone, Karen Stoffer, Steve Johnson and Angie Smith, the latter two tied for tenth place. Just two points behind Krawiec, Tonglet has the opportunity to move up as Krawiec and Hines learn their new H-D Street Rod motorcycle, which had little practice time before being rolled out at Englishtown the first weekend of June. It won’t be easy for Tonglet - or even for fellow Louisiana native Savoie - to usurp the Harley-Davidson riders, but they’ve got the equipment and the talent to make it happen.